As Felix Frankfurter and James Landis write in their preface to The Business of the Supreme Court, "To an extraordinary degree legal thinking dominates the United States. Every act of government, every law passed by Congress, every treaty ratified by the Senate, every executive order issued by the President is tested by legal considerations and may be subjected to the hazards of litigation. Other Nations, too, have a written Constitution. But no other country in the world leaves to the judiciary the powers which it exercises over us." This classic volume, first published in 1928, originated in a series of articles written by Frankfurter, then a professor of law at Harvard University, and his student, Landis, for the Harvard Law Review. 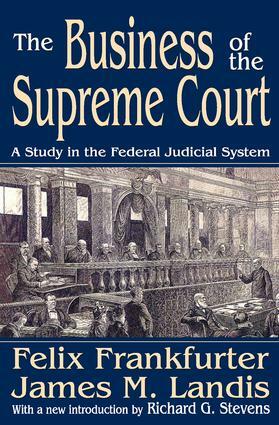 These articles chronicled and analyzed the many judiciary acts that were passed between 1789 and 1925, and illuminated the intimate connection between form and substance in the life of American law. For instance: When a community first decided to enact zoning laws--the Supreme Court had to approve. When the United States made a treaty with Germany following World War I--the Supreme Court had to define the limits and meaning of the treaty. Newly reissued with an introduction by constitutional expert Richard G. Stevens, The Business of the Supreme Court is still as fresh and relevant today as it was when first published. It is a work that will aid the student of the law to both love the law and remain true to its purposes.